Visiting Crete in October, just as the tourist season is coming to a close, has many advantages. There are fewer tourists, the weather is still excellent, and the places you want to see – in my case, archaeological sites – have not yet closed for the winter months. 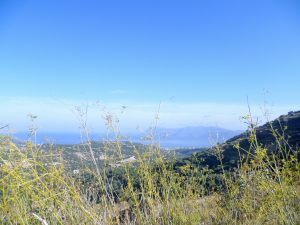 However, this post is not specifically about the archaeology, fascinating though that is, instead it is a whistle stop tour of what’s Crete has to offer in October. 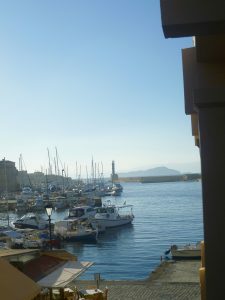 We started off in beautiful Chania. Right from its early Minoan beginnings, Chania was an important place. It has two natural harbours and, later in its history, first the Venetians and then the Ottomans, valued it for its strategic importance. But we were in Crete to visit places which are well off the tourist track, and we spent some time up in the White Mountains. For invaders, it was easier to stick to the coast. A lizard basks in the autumn sun. I can’t work out which colour it’s decided to be. Up in the mountains you can almost always see the sea – and who may be approaching. Nowadays, there is a modern road running along the precipitous edge, but you can still see the original narrow zig-zag roads, fit only for mules, which were the only roads there were until recently. Nobody in their right minds would venture up into the mountains unless they either knew it like the back of their hand, or were desperate. 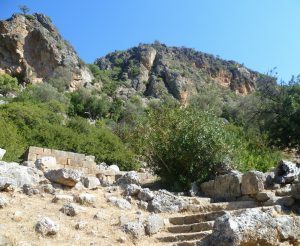 Lissos: going up to Aesclepius’s temple; note the troglodyte dwellings used by fleeing Christians in the Ottoman period in the cliff face behind. 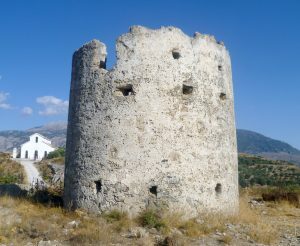 Lissos, on the south coast, is not easily reached, even today. You can see at once why the remote troglodyte dwellings carved into the rock by persecuted Christians were never discovered by the invading 17th century Ottomans. Polyrhenia, which dates back to the Bronze Age, is strategically located and, from its precipitously-located acropolis, a look-out man could see both the Cretan Sea to the north and the Libyan Sea to the south. The views are tremendous. 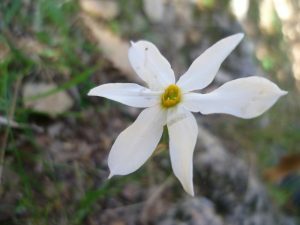 I love Mediterranean flowers and, up in the hills, there are flowers blooming, even in October, like this beautiful miniature narcissus growing in between the steep narrow rock-cut entrances to the large Minoan circular stone-built ‘tholos’ tombs at Armeni. I’d always assumednarcissi were spring flowers. They are only about three inches high and you have to kneel to catch the strong but sweet scent – but it’s worth it. Aptera, now a picturesque ruin, was once a flourishing Greek city, and destroyed by an earthquake in the 7th century A.D. Discovering its theatre was a joy. There is an unobtrusive circular stone set in the middle of the stage which enhances the voice of anyone who speaks while standing on it. The sound actually vibrates through you. It’s a curious tingling sensation and, while standing on the exact spot, the acoustic is absolutely perfect on all sides. You don’t have to shout; simply speak and your voice will be heard anywhere in the theatre. Elyros is another ‘lost’ city which was important in Greek and Roman times. There are plenty of ruins: remains of a Roman aqueduct, walls, water reservoirs and so on, but I particularly liked this, much later, windmill. I thought it had a Rapunzel air about it. 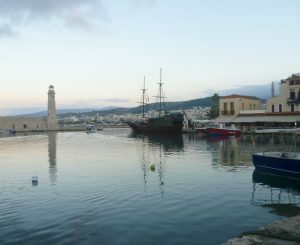 Having stayed at Chania for a few days, we moved to Rethymnon, another important Greek and Roman city. It was conquered by the Venetians in 1229, and later by the Ottomans and it, too, has a splendid harbour. 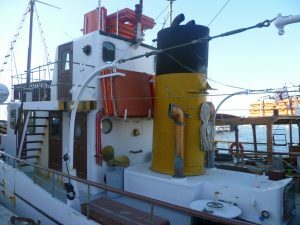 The rigged ship is, alas, not original, it is a modern ‘pirate ship’ (pirates were a scourge for much of Crete’s history) and you can hire it for parties. 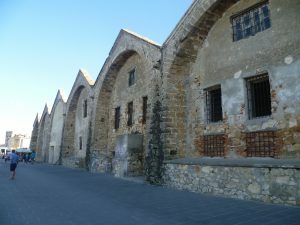 The relics of the Ottoman two hundred and fifty year occupation are all around, especially in places like Chania and Rethymnon. 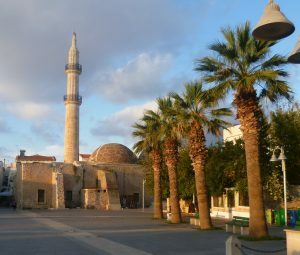 The mosque above is now an education centre. And there are a number of Ottoman fountains, merchants’ houses and arched doorways intricately decorated with fruit and flowers which remain as a testament to the skill and beauty of Ottoman architecture. I’m ending with this boat which caught my fancy. It has a faintly Art Deco look about it – crossed with the sort of toy boat a child might float in the bath. I liked the shapes it made. I hope you enjoy it, too. lizabeth travelled with Andante Travels. 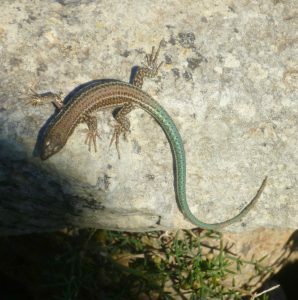 A lovely blog, thank you, displaying the variety of delights to be enjoyed off the beaten track, from the smallest of flowers to views of Venice, with watch towers and lizards in between. I was particularly impressed by the magic stone from which an ordinary voice could be heard clearly all over the theatre – I have been in some British theatres which could have benefited from such a stone – if you stand near it but not on it, can you still be heard? Thank you for your comment, Prem. To get the fizzy tingle I described, when you can actually hear that your voice is resonating round the theatre, you have to be standing exactly on the stone. You can still be heard if you are not centre stage – Greek theatre acoustics are excellent – but, for some reason, standing on the stone itself gives your voice an extra resonance. Doubtless there’s a scientific explanation for this but I don’t know what it is! Interesting and picturesque. Being ex-theatre very interested in the stone in the middle. I saw this demonstrated on a Time Dig the other day, investigating the real round table. You could see that when people stood at the side and spoke, their voices were distorted, but as soon as they stood in the middle, they were heard all around the circle. They demonstrated in circular chapterhouse – huge! – and massively with a couple of hundred people making a circle in a field. Absolutely amazing that someone in the centre could be heard all around. I wonder why the stone helped in the Crete one? It must have been some kind of technical know-how that was replicated around Greek theatres. Good to have your input, Elizabeth. I don’t think that the stone itself holds much significance; it’s the fact that it marks the exact centre that is important. The arrangement of the seating is probably crucial, too. 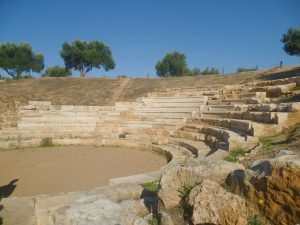 I remember sitting in the very top row of the theatre at Epidauros and hearing someone strike a match centre stage – and that is a huge theatre, far larger that the one in Aptera.